With all the options in the rapidly changing marketplace for cloud-based contact centers, it’s a challenge to find the right solution for your business. 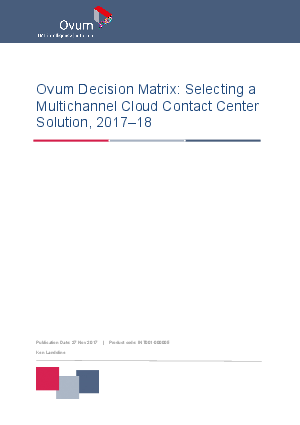 Easily compare the leading contact center solution vendors in the Ovum Decision Matrix: Selecting a Multichannel Cloud Contact Center Solution, 2017-18, based on their ability to offer full voice call routing and multichannel customer service in the cloud. Learn why Genesys has been positioned as a leader who has solutions for businesses of all sizes and in all industries around the world.